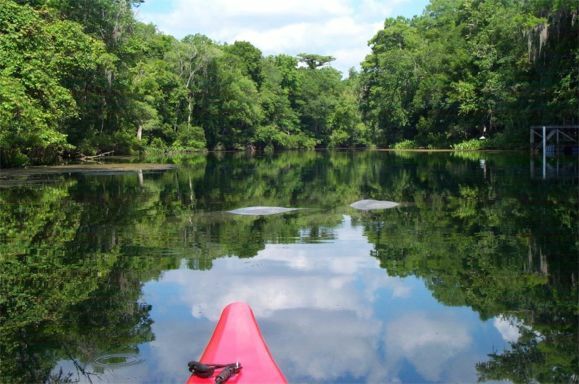 I was paddling on the Wakulla River starting out from the park in the Town of St. Marks. 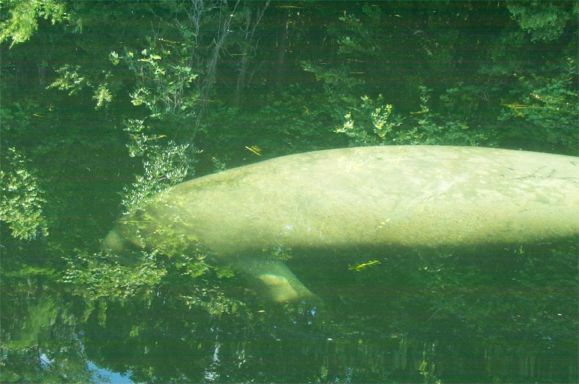 I spotted the Manatee family about a mile north of the US 98 bridge. Sitting still, I started taking their pictures. They began moving towards my red kayak. They were in no hurry and seem to be interested , coming up and gently examining the kayak. Around the bend I heard a group of paddlers coming and so did the manatees. They began moving off and so did I.
Manatees who like red kayaks? 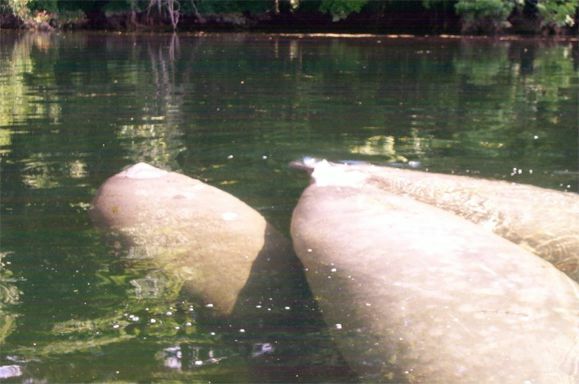 Florida Manatee Sanctuary Act of 1978, which states: "It is unlawful for any person, at any time, intentionally or negligently, to annoy, molest, harass, or disturb any manatee." Anyone convicted of violating this state law faces a possible maximum fine of $500 and/or imprisonment for up to 60 days. Conviction on the federal level is punishable by fine of up to $50,000 and/or one year in prison. 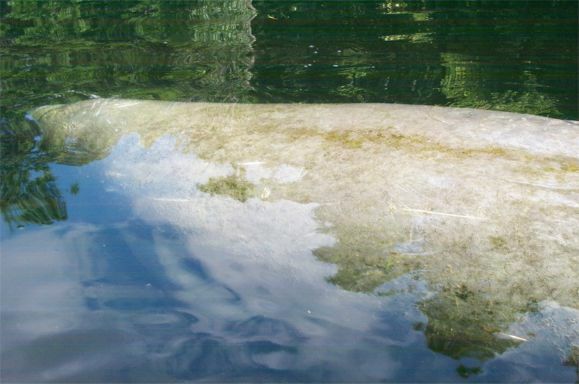 The State of Florida can pursue prosecution under federal law in circumstances of extreme harassment, resulting in the death or injury of a manatee. 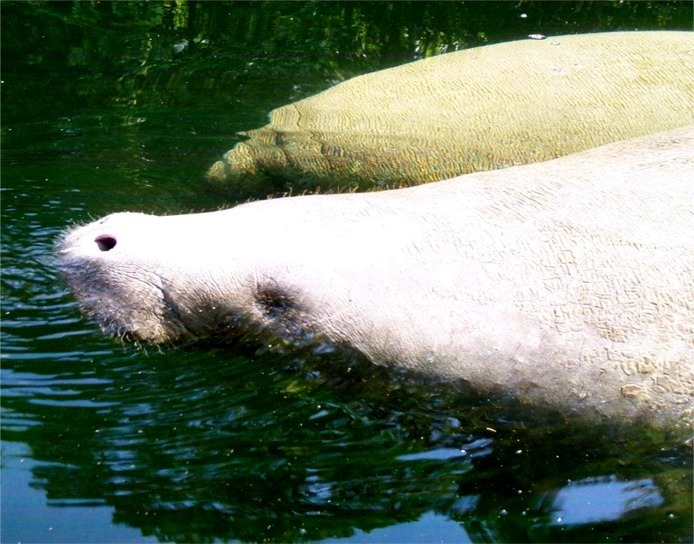 The West Indian manatee is an endangered species and is protected by state and federal law. Please avoid harassing or disturbing manatees. Harassment is defined as any activity which alters the animal's natural behavior. 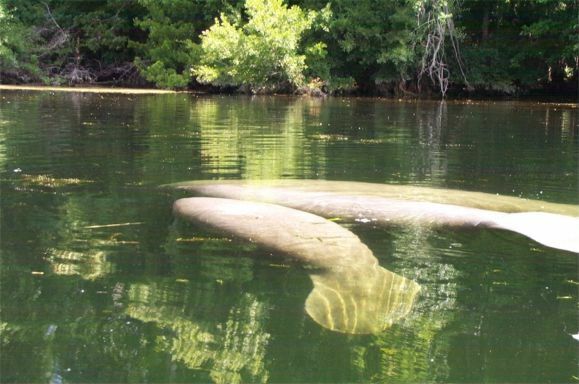 By altering the manatee's natural behavior, you may create the likelihood of danger that is bad for the animal and against the law. Look, but don't touch manatees. Also, don't feed manatees or give them water. 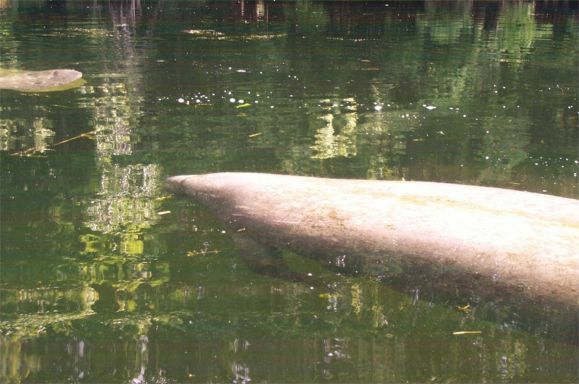 If manatees become accustomed to being around people, they can alter their behavior in the wild, perhaps causing them to lose their natural fear of boats and humans, and this may make them more susceptible to harm. 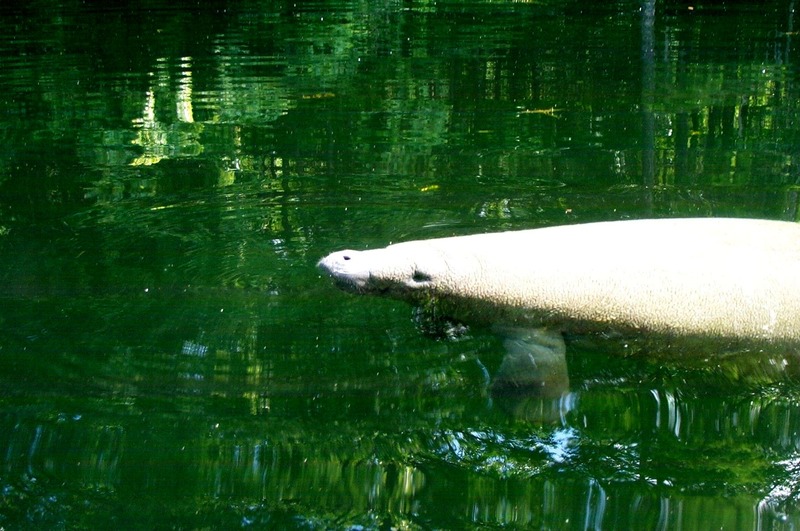 Passive observation is the best way to interact with manatees and all wildlife. 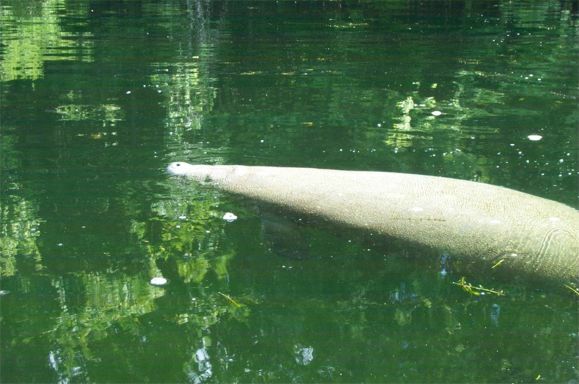 Do not pursue or chase a manatee while you are swimming, snorkeling, diving or operating a boat. Never poke, prod or stab a manatee with your hands, feet or any object. 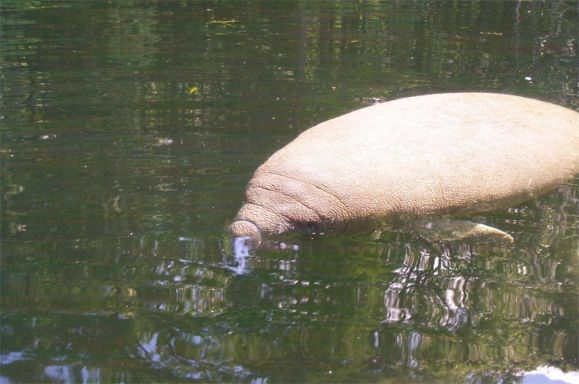 If a manatee avoids you, you should avoid it. 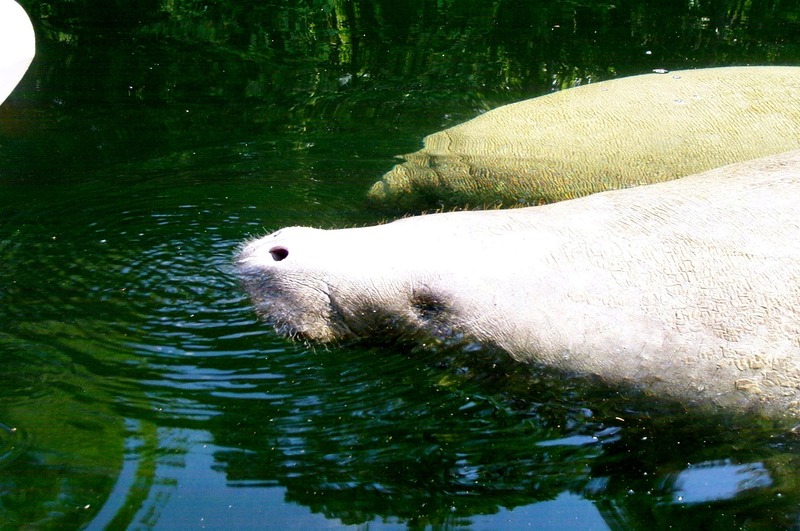 Don't isolate or single our an individual manatee from its group, and don't separate a cow and her calf. Don't attempt to snag, hook, hold, grab, pinch or ride a manatee.